This book is not for the faint of heart. It is an intense story about two brothers, Deo, who is 15, and Innocent, his older disabled brother, running for their lives in modern war-torn Zimbabwe. The entire village, including their Mom and Grandfather, were killed by the army. Deo and Innocent narrowly escaped. All they have left is each other, Deo’s love of soccer, and Deo’s handmade soccer ball, stuffed with money his Mother had hidden in their hut. They escape to another village where a family friend lives. It’s not safe to be there either, so he tells Deo to go see a woman who can get them to South Africa. Deo spends all of his money on a risky passage to South Africa, where he hopes his brother and he will be safe. They are not welcomed in South Africa because the people there are struggling and they don’t want refugee’s taking their jobs and food. They go from dangerous town to dangerous town looking for a safe place. When violence takes the life of his older brother, Deo is defeated. He turns to drugs, and it looks like there is no hope for him. 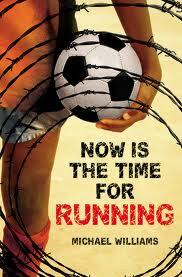 His love of soccer ends up being his salvation and readers will be rooting him on all the way to the last page. To find out what happens to Deo, read the gut-wrenching and violent, yet heart-warming and inspirational book Now Is the Time For Running by Michael Williams. Series: This book is not part of a series. This entry was posted in Fiction, Survival and tagged brothers, homeless, mental disabilities, refugees, soccer, survival, Zimbabwe. Bookmark the permalink.